This entry was posted in Uncategorized on November 29, 2012 by Firm Tothong. I really like the morals of the Lewis Hyde’s “Gift” I also liked how he coined up the states of tale as somewhat being in between a dream state and the not so real. Q1: What is Hyde’s idea of a gift? Does it exist in our society, perhaps under a different name? How might it be more a part of our society? AN: It’s seems as though form of natural resources of anything value is placed on, that allows us appreciate the quality of life could be a gift. at first I questioned why we would come together to show that level of respected or in celebratory union only to past this gift on to someone ells. but in a way I think it’s only serves as a representation of life, life is always the gift that keeps on giving. that’s why it was so natural for the mother and the mother spirits in the form a birds felt so right. the act of giving also is a form of saying we are not alone, so when we give there’s that feeling of warmth and compassion that which makes us human. For me I think this gift diffidently exist in our society today, I think for me it’s between love and compassion. And it could more apart of our lives and our society if we begin to practice more towards one another, teach it to our every living person. Q2: Describe a commons that you interact with regularly. What are the official or unofficial rules that regulate that commons? Who enforces those rules? Does it work and is it sustainable? I don’t correctly interact any particular commons on a regular basest, but I grew-up on farm lands that was in the state of what appeared to be a small common between family and friends who shared the spaces they owned, they planted a raised life stock that could support everyone in different seasons different platforms would be take turn to fill the slot. I don’t think any one person or persons was in-charge people just work towards one gold and there can’t be any selfishness, where the self strive others fail, if one group wants and needs become more than everyone elise, it creates division and set-backs which leads to a breakdown and one for them selves, there as to be lots of compromising, be able to meet each other part way. this sounds easy but is very hard to achieve. Q3: Think back to the Prisoner’s Dilemma game that we played in class. What are ways in which we can keep people from acting solely out of self interests? AN: For the common good, I feel every person has at less one or two needs and desires, that needs to be fulfilled, and when we can make that exchange between us, a chain reaction starts that makes us feel more alive ad apart of something, whether it’s a social group or common I feel this follow of energies, lets call it freedom of spontaneous combustion. I feel when we are able to make the exchange in others this reaction could be an endless turn over in emotional residual investments. each person has their own needs and wants so working together investing in each others well being. I think the future might star to become more promising. the gift of the dead of night will prove to be a richer more successful new day. This entry was posted in Uncategorized on November 28, 2012 by Omar. This entry was posted in Uncategorized on November 27, 2012 by Firm Tothong. Excerpt from Elinor Ostrom’s Governing the Commons. What is Hyde’s idea of a gift? Does it exist in our society, perhaps under a different name? How might it be more a part of our society? Describe a commons that you interact with regularly. What are the official or unofficial rules that regulate that commons? Who enforces those rules? Does it work and is it sustainable? Think back to the Prisoner’s Dilemma game that we played in class. What are ways in which we can keep people from acting solely out of self interests? This is a little bit of a side track but I really had to put it up here before got into my responds for The Gift. Reading the article reminds me of two works that really inspired me in the past. The second one is a last track song in John Mayer’s second album, Heavier Things. The song called ‘Wheel’. Could be a perfect backing track while reading my post. It’s interesting how Hyde’s reference mostly had a feel of folklore and local belief. This emphasize that these motion of gift in local tradition before things was monetized and replaced by the market. This, for me, it juxtaposed the idea of global and local in a quite interesting way. On one hand, money is a very crucial tool that make globalization possible. The boundary of exchange can extend outside of the community. On the the other hand, building a circle of gift is also to make this cycle of trust. To be able to let things goes out of your sight and believe that it would come back. Trust in gift cycle is very different with how we trust in market. Where branding become what we put our trust in. If things have a logo on it, it could be easier to trust. But in gift cycle, what we trusted in is the people, the community. That will catch us even before we fall. The expansion of ego mentioned in the chapter is also sounds very intriguing. As a wise old man or king would refer to themselves as we. It show an understanding of life as part of bigger ecosystem and the self become only a representation of something bigger. Gift absolutely do existed in our society. I might had been there way longer than even other forms of exchange. Like in the chapter where Hyde did refers a lot to mother/child gift circle. It might not be an exaggeration to call all motherhood as a gift, trust and unconditional. How might this be more a part of our society? My answer might kind of a bit of a long shot. But I think just listen more what women have to say. These ideas of utopia and economies systems are all coined by awesome male philosophers throughout centuries. I would love to know if a few next ones after my time will some more female contributors on the subject. The game itself providing a pretty suggestive narrative context to the game, a prison, where you could hardly find anyone to trust. I think the game fold up in later rounds in quite interesting way. When people pair up to play a same game. It just gets much easier to trust when you know that you’ll have to relate to this person again. But the last round where you know that is the end of the game you can easily betray your partner since you might never be playing this again. That last shot benefit is could easily come out as our common understanding that getting more money the better. I myself didn’t see if that was stated in game’s rule anywhere ( might be my mistake though. ) So the winning condition is actually depends on player’s own interpretation if you’re going for trust or money.However, I wouldn’t think that we should have too strict rule that keeping people out of their interest though. As we were talking a bit after the game that if you just always give out to someone else all the time would the game still be fun? Everyone would have a same amount of money and there would be no winner (or arguably, everyone wins.) Is that kind of extremely absolute game fun? Myself would says no.I talked about this before in previous reaction comment, but what makes a good game is to have a meaningful choice. And I still think that also apply to a good life. Also from the other way around, because it is a choice, that make it meaningful. Basically, in Thailand we searched for Apollonian concept ( the only right way to do ) of sufficiency economy (which not so surprising, seems to not existed or at least yet to identify.) While Solidarity support the diversifying the answer for this idea of alternative economy. I think it is a very critical take against Capitalism. And this might somehow speaks back a lot to the Occupy movements. People and diversity against centralized, institutionalized corporations or government. This entry was posted in Uncategorized on November 27, 2012 by huong. This entry was posted in Uncategorized on November 27, 2012 by Natashia. A group called Artefacting has an interesting banking project called Blood Bank coming up at No Longer Empty’s group show called How Much Do I Owe You? The show will make use of an old bank in Long Island City, and the Blood Bank project will be happen in one of the store fronts. 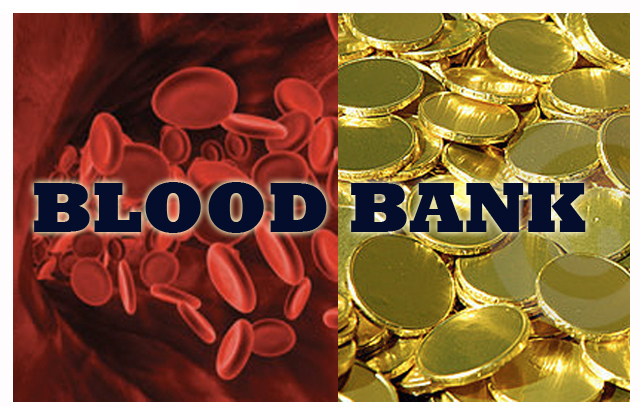 Exchange is based on the value of blood, people can donate blood or stories about their relationship to it. The show opens Wednesday December 12th at 7:00. Caroline Woolard will have a piece in it, I think produced in conjunction with some of her students. This entry was posted in Uncategorized on November 26, 2012 by melanie. This entry was posted in Uncategorized on November 24, 2012 by Omar. Here are a couple of questions and notes of interest I pulled from the reading for this week, Keith Hart’s The Memory Bank; Exchange in the Human Economy. Why does Hart call money a Memory Bank? What archival and communicative powers does he associate with money? What does Hart think might be the possible redemptive qualities of money and markets? Adam Smith wrote that the idea of exchange came from a deep seated propensity of human nature. In other words, he says its a natural thing. Smith acknowledged a degree of social complexity in the transactions: the idea of contract, private property (mine and yours) and equivalence (fairness), none of which could plausibly be traced to the non-human world. People who participate in markets are willing to give up their goods in return for payment; and their customers then have the right to do what they like with those goods as well. This is so common that we think of it as normal or “natural.” It is in fact quite rare within the range of known human societies. What gives buyer and seller confidence that they each have the rights to deal with commodities as they do? The power of state law reinforces their contract and usually supports the money involved. They may operate as isolated individuals only because of the huge social apparatus backing their exchange. Money and markets thus have their origin in the effort to extend society beyond its local core. Notes on Marx’s Capital: people ought to control machines and through them money, but reality is the reverse, money controls both machines and people. Marx felt the political task of the people should then be to reverse this phenomenon. Commodity: useful product of labor, which by means of a social abstraction, is endowed with the value of exchange. When we do things for each other in society, have to detach these commodities for external consumption from what we do for ourselves. Hart feels that money is the principal means for us all to bridge the gap between everyday personal experience and a society whose wider reaches are impersonal. Money is a ‘memory bank’ (Hart 2000), a store allowing individuals to keep track of those exchanges they wish to calculate and, beyond that, a source of economic memory for the community. This entry was posted in Uncategorized on November 19, 2012 by melanie. This entry was posted in Uncategorized on November 19, 2012 by Atif.